Lots of progress was made on the first e plate! We cut out both plates out of polycarb, and layed down dual lock. Because we are using so many motor controllers, we decided to stack some on top of each other as was safe and reasonable. Because of their distance from the PDP, we soldered some extension wires and will continue to add them as needed. 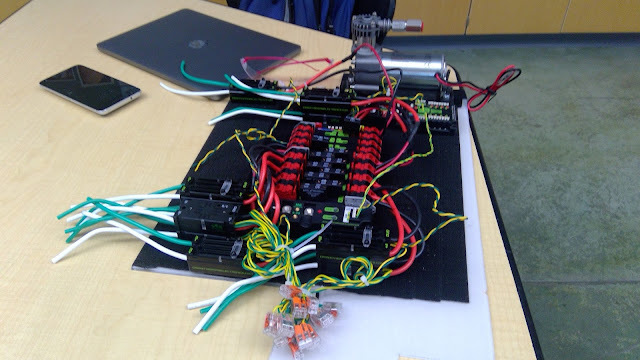 We also wired up most of the canbus, as we are waiting on the arrival of a couple of Roborios. We are also going to order some more 40 amp fuses, as we ran out. Overall, our progress is going quickly but smoothly, and we will continue to make adjustments per our mentor's instructions. Hopefully we can avoid the general electrical issues that plagued our performance at Calgames. Till next time!